There's no doubt that gnats are a pesky bug that can plague your home, especially your kitchen. 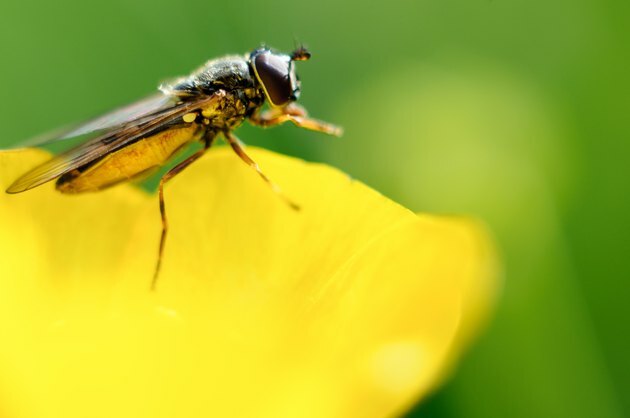 It's easy to assume the pests are gnats, but they could also be fruit flies or drain flies. Once you identify the bug and are certain they're gnats, you can proceed with a strategy to get rid of them. As much as you probably don't want to, get close to the bug next time you see it. Gnats are black and have long legs. If that's not the description that fits the bugs in your home, it could be another common household pest. Fruit flies are brown with red eyes. If you have drain flies on your hands, they'll be fuzzy with moth-like wings. Fruit flies love the kitchen whereas gnats tend to stick by household plants. Gnats will flock anywhere that has moisture and humidity. When you bring home new houseplants, it's beneficial to place them in a new pot with fresh soil as gnats can come in the plants from the store. Not only will easing up on the water help with gnats, but it will also be helpful for your plant as well. Once you make a meal, sit down and eat, you may want to put off the dishes for a while. Unfortunately, it doesn't take gnats long to smell food and start swarming around the kitchen. One solution would be to take turns with a family member each night to pick up and clean the dishes promptly after dinner so you can cut back on the gnats. In addition to keeping your kitchen free of dirty dishes, take out your garbage as soon as you notice it's full. Gnats will smell the rotting food in the trash and start accumulating. If you need to try a home remedy to get rid of gnats, a vinegar trap is usually the go-to method for many people. To put this trap together, you'll need water, dish soap, sugar, apple cider vinegar and a container. Grab the container you wish to use and add 1 liter of water, 2 tablespoons of vinegar, 1 tablespoon of sugar and just a few drops of dish soap. Mix the ingredients and place the container where you see most of the gnats. Usually, the smell of the apple cider vinegar is appealing to the gnats and they end up dying as they enter the mixture due to the soap. If you aren't quite sure where the gnats are coming from, it's worthwhile to set up small containers around the home.